In the mountains on the edge of the Sahara desert in Southwest Morocco, families are leaving their villages due to severe drought conditions which have left the local population struggling to survive. The area is bathed in fog for six months of the year and it is this fog which is providing a lifeline to rural communities. A Moroccan Non-Governmental Organization (NGO) called Dar Si Hmad has been harvesting water from the fog and piping it to nearby villages. So far they have provided clean drinking water to 500 people in five drought-affected villages. Their project gathers an average of 6,000 litres of water a day and has given people in the area new hope. The technique of fog harvesting uses a fine mesh suspended on a large frame. Tiny fog droplets collect on the mesh. Once enough of these droplets have merged together, they roll down the mesh to collect in a reservoir at the bottom of the frame. Typically the areas where these nets are positioned are subject to high winds and many nets are damaged as a result. The revolutionary ‘CloudFisher’ nets used by Dar Si Hmad were designed by engineer Peter Trautwein of the Wasserstifttung Foundation in Germany. 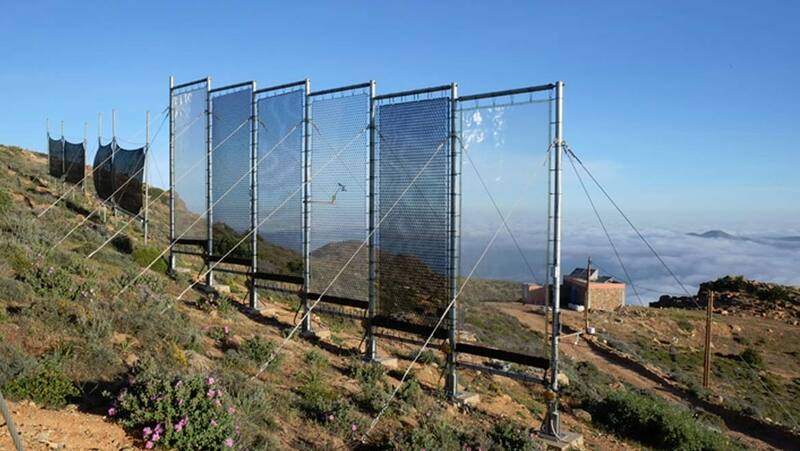 These are twice as effective as standard nets and can withstand the high wind speeds common in the area of Morocco where they are placed. The CloudFisher nets feature a dynamic fixture system inspired by trees bending in the wind without snapping. Rubber expanders are used to hold the nets in place and thus reduce the impact of wind forces. The expanders are designed to break before the net is damaged, and are easy and cheap to replace. The fog net is also supported by a plastic grid which helps maintain stability during high winds. Lastly, the collecting trough below the net has been designed to follow the movement of the net in high winds, thus reducing water losses. Peter Trautwein presented the new CloudFisher at the Conference on Fog, Fog Collection and Dew in Wroclow. Before the project started, villagers connected to the Dar Si Hmad project had to walk for three hours a day to get water from already depleted wells. There other option was to leave their homes and seek work in cities. Now though, water is readily available from the taps in their homes. This is made possible by the 600 square meters of nets placed at an altitude of 1,225 meters above sea level. There is 7 kilometres of piping which directly supplies fog water to the villages, which contain 161 families. The system is a great example of an integrated water resource management system (IWRM) which considers water resources to be integral to the ecosystem as well as social and economic goods. This CloudFisher system has brought positive change to the communities it serves, who were become increasingly anxious regarding the lack of water and recurring droughts in their region. Many households started migrating to cities and selling their livestock, which all impacted the cultural heritage of the area. The impacts of having fresh water piped to the villages is immeasurable and is providing residents with new hope for their future.